The idea of the digital picture frame is logical, but in execution, it doesn’t always work. In many cases, the picture quality isn’t great, the frames are cheesy and the whole vibe is a bit suburban-country-living gone wrong. A new art-tech startup, Meural, is making digital picture frames super classy and innovative. The image appears on a matte LCD display and the frame is made by hand of maple wood. The New York City-based startup isn’t interested in a slideshow of family vacation snaps from your latest family trip to Disney, either. The idea is for you to rotate images of fine art and professional photographs in your Meural. The discovery component of the Meural “digital canvas” makes it appealing to the indecisive set. And what if your tastes change? Or your mood shifts? Or you grow tired of a particular image? 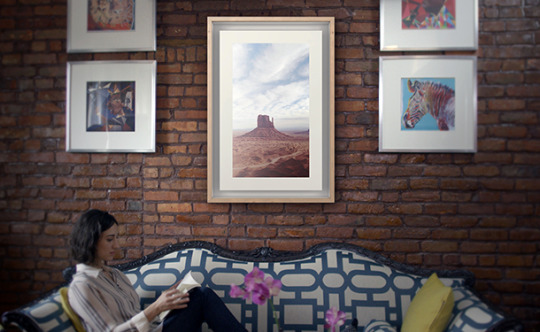 The Meural frame is connected to an app wirelessly, so you can change the image from across the room. But, also, if you are standing in front of the image, the frame is gesture sensitive, so you can wave your hand in front of the “digital canvas” and change the image displayed. The Meural frame is not available for purchase just yet. It’s in pre-order, starting at $395, and is expected to ship this fall. The technology that Meural is using to collect pre-orders is a new “standalone” crowdfunding software developed by the alternative finance platform RocketHub. The pre-order software, called LaunchPad, allows businesses to customize the RocketHub software to their particular needs. Vukicevic, the founder of Meural, was previously the CTO of RocketHub.